Without accessible prescription labels, blind people are forced to guess about the medication in their prescription containers. Would a pharmacy give medication to sighted consumers without a label? Of course not. A growing number of pharmacy chains and health care organizations in the United States now offer talking prescription labels and other forms of accessible prescription information for customers who cannot read standard print. Accessible labels are a critical health and safety issue and an important privacy issue. This post has information about what is being offered in the United States as of March, 2016. Resources for accessible labels appear at the end of the post. Please help spread the word! These companies have taken a leadership role in making sure blind pharmacy customers can privately and independently access information about their prescription medications. And please let these companies know how they are doing. Accessible labels help the growing senior population as well as people with disabilities who cannot read standard size print. Every pharmacy in the country should be offering them. Please visit the Contact Page of this website to share your feedback or for more information. You may also contact the American Council of the Blind, the advocacy organization that has worked on the initiatives described below. ACB can be reached at 202.467.5081. The Caremark initiative was the result of Structured Negotiation between the company and the American Council of the Blind, the California Council of the Blind, and the American Foundation for the Blind. The Law Office of Lainey Feingold and Linda Dardarian of the Oakland civil rights firm Goldstein, Borgen, Dardarian & Ho represented the blind organizations. Structured Negotiation is an alternative dispute resolution process. No lawsuit was needed or filed. In March 2014 CVS announced that it had begun offering talking labels to blind customers across the United States through its mail order pharmacy, cvs.com (this is a different pharmacy than Caremark). Cvs.com offers ScripTalk talking labels. In early 2016 CVS expanded this service and can now ship prescription medications with the talking labels to a local CVS pharmacy for pick up by the customer. CVS is also providing prescription information in large font in the stores. This initiative was also the result of Structured Negotiation with the same organizations and lawyers that negotiated the agreement with Caremark. The American Council of the Blind, and Lainey Feingold and Linda Dardarian continue to work with CVS on these issues. In late 2015 Express Scripts began offering talking labels through Envision America’s ScripTalk program. Express Scripts, the largest pharmacy benefit management organization in the United States, also offers braille and large print prescription labels. Members of Express Scripts interested in receiving prescriptions with the talking labels should contact Envision America, makers of the ScripTalk program. Envision America can be reached at 1-800-890-1180. Envision America can sign Express Scripts members up for the ScripTalk program. Braille and large print information is available by contacting Express Scripts directly. At the end of 2015 H-E-B grocery chain announced that it had begun offering ScripTalk talking labels at designated locations in Texas. H-E-B is engaged in Structured Negotiation with the American Council of the Blind of Texas and several blind H-E-B customers. Disability Rights Texas and the Law Office of Lainey Feingold are working on the initiative. Special kudos to H-E-B for including information about the talking labels on the phone messages in stores offering the service. In September 2015 Humana announced that it had begun offering talking prescription labels, as well as braille labels through the ScripTalk label system to its mail order customers across the United States. Talking Labels are also available in Humana’s seven PrescribeIT retail locations in Florida. Humana participated in Structured Negotiation with the American Council of the Blind and blind Humana customers in Nevada, Georgia and Florida. No lawsuit was needed or filed. (You can read more about Structured Negotiation here. The Law Office of Lainey Feingold and Linda Dardarian of the Oakland civil rights firm Goldstein, Borgen, Dardarian & Ho represented the blind organizations. Kaiser’s commitment to providing Talking Rx and alternative formats is a result of Structured Negotiation with the California Council of the Blind and several blind members. The initiative is being monitored by Megan Ryan of Goldstein, Borgen, Dardarian & Ho (510-763-9800 or you can email Megan, and by Meredith Weaver of Disability Rights Advocates (510-665-8644 or you can email Meredith. In February 2016 Rite Aid announced its accessible prescription information initiative. Rite Aid is offering customers with visual impairments two options for talking labels. First, the company provides the Talking Pill Reminder in all of its Unites States retail locations – more than 4,500 stores. (See product description below) Second, if the Talking Pill Reminder is not effective, Rite Aid will provide medications with the ScripTalk talking label system. Prescription medications with the ScripTalk talking label will be sent to the customer’s local Rite Aid pharmacy for pick-up. Rite Aid also offers customers Patient Information Sheets in large print at Rite Aid locations nationwide. Rite Aid’s Section 504 Disability Coordinator, Michael Mack, at (717) 975-5878 or you can Send an email to Mr. Mack. Further information is available about the Rite Aid program. In June of 2014 Walgreens began offering its proprietary Talking Pill Reminder at 8,000 Walgreens Stores (including Duane Reade stores) and through Mail Order free of charge to Walgreens pharmacy customers with visual impairments. A new device is provided with each prescription and prescription refill. The program also applies to Duane Reade pharmacies, which are owned by Walgreens. The initiative was the result of Structured Negotiation between Walgreens, the American Council of the Blind, and its affiliates in California and Illinois. The talking device was developed by Walgreens and adheres to any prescription container. Pharmacy staff records the prescription information and the customer can play it back with the press of a button. Staff has been trained to allow customers to listen to the recording in the store to assure the recording is clear and understandable. Walgreens also offers large print prescription information. Walgreens welcomes feedback on the company’s initiative. Customers may call 1-800-925-4733 extension 4. Read the Walgreens talking pill bottle press release. In 2012, Walmart became the first national chain in the country to offer talking prescription labels to its blind customers. The company continues to offer ScripTalk talking labels through its mail order pharmacy and at selected Walmart stores. A customer who needs talking labels in their local Walmart store should contact the pharmacy. Customers may also contact Envision America at (800) 890-1180 for more information about adding new Walmart stores to this program. The Walmart mail order pharmacy can be reached by calling toll free to 1-888-227-3403. Walmart participated in Structured Negotiation with ACB, CCB and AFB, with Lainey and Linda Dardarian representing the blindness organizations. As with the other companies, no lawsuit was needed. Here are four accessible label systems currently available in the United States. Envision America offers the ScripAbility Accessible Prescription System. The system includes talking, braille and large print labels. The talking label is an RFID chip that is adhered to a prescription container. A pharmacy customer accesses data on the tiny chip with a ScripTalk reader provided free of charge by Envision America. When the customer places the container on the reader the information encoded on the chip will be read aloud. More than three minutes of information can be recorded on the chip. The device has a volume control feature and will output to a computer for deaf-blind customers. In addition to talking labels, a pharmacy can print large font prescription labels up to 26pt along with embossing Braille labels for its customers. AccessAMed offers the Digital Audio Label The label is a two inch by one inch label that adheres to a prescription container. Sixty seconds of information can be recorded by the pharmacy on the label with a docking station and text-to-speech software from AccessAMed. The customer presses a button on the label to hear the information; no additional device is needed. Walgreens offers the proprietary Talking Pill Reminder. It is offered free of charge to Walgreens pharmacy customers and is for sale to others. The device has a thirty second recording capacity and adheres to a prescription container. Pharmacy personnel record the message and the customer presses a button to listen. Talking Rx is another product where the pharmacist records the information that is played back by the customer when a button is pushed. Talking Rx has a sixty second recording capacity. 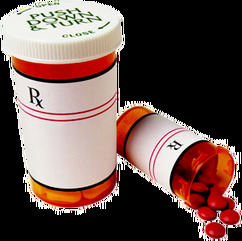 A cylindrical prescription container fits into the device.